Rebel Records has announced the release of Mickey Galyean & Cullen’s Bridge’s second Rebel recording, Songs From The Blue Ridge. Hot on the heels of their Rebel debut My Daddy’s Grass – which topped Bluegrass Unlimited’s National Survey Chart. Songs From The Blue Ridge gives every indication of being a radio/fan favourite. 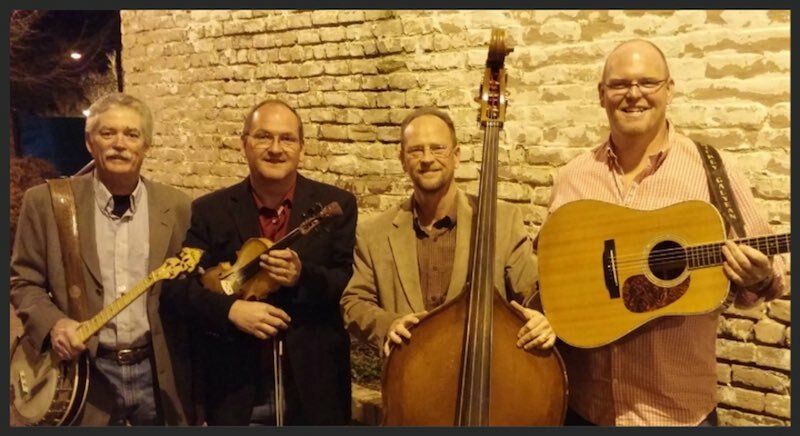 Unapologetic bluegrass is what Mickey Galyean & Cullen’s Bridge deliver. Pounding rhythms, searing vocals, strong melodies and just the right mix of deft originals and ripened treasures; that’s the formula that works for this group. Emanating from the bluegrass heartland between Galax, Virginia, and Mt. Airy, North Carolina – Round Peak to “those in the know” – they are bearers of a tradition that has thrived there for generations. Band leader Mickey Galyean grew up in bluegrass. His late father Cullen (hence the name, Cullen’s Bridge) was a lifelong picker. The band’s name is a perpetual tribute to him as well as a statement on its musical philosophy. Mickey is a strong singer who sports a driving rhythm guitar; he sets the tone for the band. Holding forth on banjo is Rick Pardue, a North Carolinian with a penchant for songwriting; he had the 2012 IBMA Song of the Year and is a past winner of the MerleFest/Chris Austin Songwriting Contest. Bass player Brad Hiatt sets the tempo the band’s performances; his instrument of choice once belonged to famed Flatt & Scruggs picker Cousin Jake Tullock. Billy Hawks adds soulful melodies with his flowing fiddle; he’s logged time with Doyle Lawson and Rebel artists Big Country Bluegrass and Junior Sisk & Ramblers Choice. The disc is evenly divided between band originals and bluegrass fare. Dixieland For Me first saw the light of day in the middle 1960s on a bluegrass album by George Jones and Melba Montgomery. The Country Gentlemen had recordings of The Convict and the Rose and Wear a Red Rose. Larry Sparks made popular Harold Russell’s These Old Prison Bars nearly 50 years ago. Of more recent vintage is Dudley Connell’s (Seldom Scene/ex-Johnson Mountain Boy) Too Late to Say Goodbye. The pleading Now I’m Losing You was penned by Mickey, who also offers a thoughtful reworking to a song recorded in the 1960s by the Stanley Brothers, Drunkard’s Dream. Cullen Galyean’s The Blue Ridge Mountains is an autobiographical account of his life in the hills. Pardue takes a strong stand about the purity of his music with No Candy in My Bluegrass. Hawks’ Outback is an original fiddle tune that sounds like one you’ve heard all your life – it’s that good. Despite the pensive sound of its title, Hiatt’s She’s Gone is barn-burning up-tempo bluegrass. As with all good bluegrass albums, you need a gospel song; Pardue’s You Can Go to Heaven, complete with the assurance that “You don’t have to have a PhD… heaven is waiting for the ones who believe,” fills the bill. Mickey Galyean & Cullen’s Bridge have produced an outstanding album that will delight young and old fans of mountain music alike. Click here to stream, download or buy Songs From The Blue Ridge. 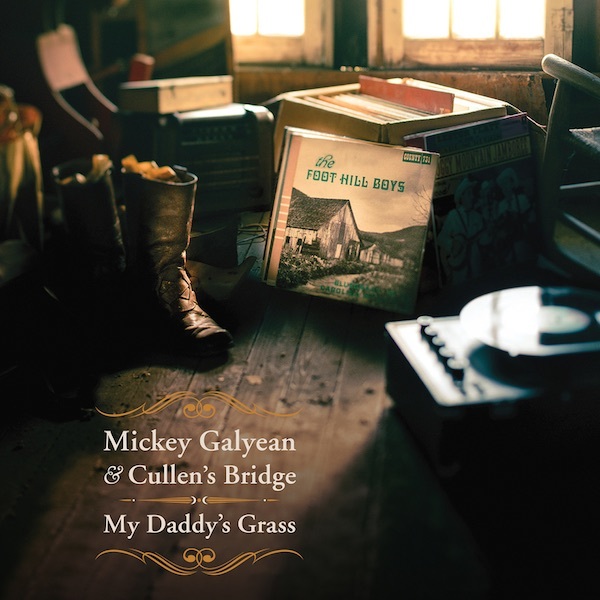 Rebel Records has announced the release of My Daddy’s Grass (REB-1856), the Rebel debut from Mickey Galyean & Cullen’s Bridge. Mickey Galyean hails from Lowgap, North Carolina, a hotspot for mountain music and one of the oldest centres of the North Carolina bluegrass scene. He is also the son of legendary five-string banjo player Cullen Galyean, formerly of well known and greatly respected regional groups the Foot Hill Boys and the Border Mountain Boys. Mickey formed Cullen’s Bridge with the intention of recording new and classic material in the traditional style of his father and other area musicians. The result is an album that does justice to the sound that his dad was so well-known for in the 1950s and 60s. Cullen’s Bridge features Galyean on rhythm guitar and singing lead with a rich, powerful voice. He is joined by Brad Hiatt on acoustic bass and baritone vocals and Rick Pardue on banjo and tenor vocals. Pardue, author of the 2012 IBMA Song of the Year, “A Far Cry from Lester and Earl,” also contributes five original tunes to the album. These tunes showcase his range as a songwriter and the strength of the band, from the witty ballad “I’d Have a Dime” to the sentimental “I Found My Daddy’s Grass,” which will surely resonate with anyone who grew up in a bluegrass family. Billy Hawks, formerly of Doyle Lawson & Quicksilver, Big Country Bluegrass, and Junior Sisk & Ramblers Choice and winner of the Galax Bluegrass Fiddle Competition, rounds out the group. This debut album blends rare and powerful lead vocals and strong, close harmonies with traditional bluegrass rhythm guitar and sparkling lead instrumentation. The repertoire includes great originals along with a few familiar favourites, like Dave Evans’ “One Loaf of Bread” as well as a blistering rendition of the Stanley Brothers classic “We’ll Be Sweethearts in Heaven,” featuring a duet with the late James King (one of his last recorded performances). “Brother Paul,” another Pardue original, provides some gospel flavour to the mix, enhanced by Galyean’s strong vocals. This record is sure to delight both young and old fans of powerful, hard-driving mountain music. My Daddy’s Grass is available at County Sales, iTunes, Amazon, and at other retail outlets where bluegrass music is sold. Rebel Records signs Mickey Galyean & Cullen’s Bridge. 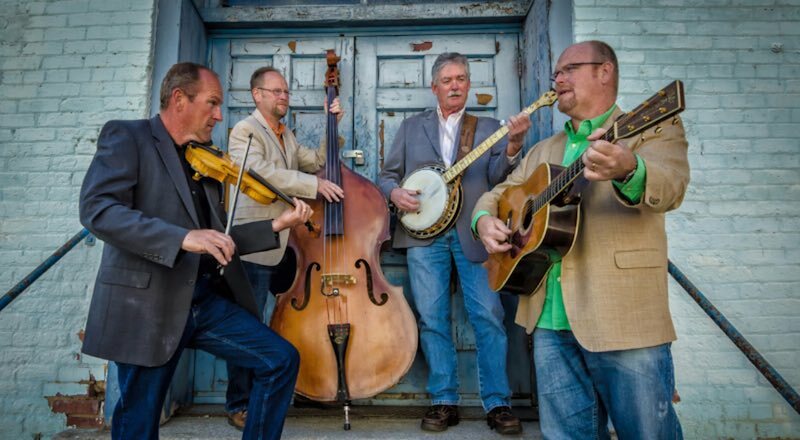 Hailing from the musically rich area of Lowgap, North Carolina, the group plays traditional bluegrass at its finest. The band recently finished recording its debut album for Rebel called My Daddy’s Grass. This album is due out later this summer. Mickey Galyean was raised around bluegrass music. He is the son of well known musician Cullen Galyean, a prominent 5-string banjo player who was part of a very active bluegrass scene in a time when the music was gaining prominence in the Southeast. After Cullen’s passing in 2010, Mickey felt a strong desire to keep the beloved music of his father alive and in 2011, formed Mickey Galyean & Cullen’s Bridge in his dad’s honour. The group released one independent CD, Rolling with Tradition, before signing with Rebel. It is a unique and very special event for Rebel Records to present this upcoming release by Mickey Galyean and his fine group Cullen’s Bridge. Mickey’s dad, the late Cullen Galyean was a special musician—one of the best 5-string banjo pickers of his era. As a young bluegrass fan, I was mesmerized by his picking. I became a friend and a follower, often driving long distances to hear him play. After starting our County Records label, we arranged to record his then current band The Foot Hill Boys, as well as a later record by the Border Mountain Boys. Mickey has absorbed and inherited everything he needs from his dad and his family, and we are excited to be a part of handing down this great musical tradition, from father to son – Dave Freeman, Owner, Rebel Records. In addition to playing rhythm guitar, Mickey—with his strong and powerful voice—sings lead on a number of songs on the album. He is joined by Brad Hiatt who plays acoustic bass and sings some baritone, tenor, and lead, and contributes original material for the band. Billy Hawks is a veteran fiddle player who has won the Galax fiddle competition and worked with a number of prominent acts, including Doyle Lawson & Quicksilver, Big Country Bluegrass and Junior Sisk & Ramblers Choice. Rick Pardue plays banjo and sings tenor for the group. He is an excellent songwriter who won IBMA’s “Song of the Year” award in 2012 for the popular Bluegrass hit “A Far Cry from Lester & Earl.” Most recently, he won the prestigious Chris Austin Songwriting Contest at MerleFest. On this new recording he has another memorable cut in “My Daddy’s Grass“—a song that will resonate with many of today’s musicians who grew up in bluegrass families. We are thrilled and excited to be a part of Rebel Records. It’s an honour to have our music associated with one of the oldest and most respected labels in bluegrass music and to follow in the footsteps of all the great performers who have been on the Rebel label throughout the years. We are extremely proud to bring our music and extend the rich legacy of Cullen Galyean’s songs to all the great fans of traditional music – Mickey Galyean.